Huge home overlooking the river complete with its own waterfall and stream. 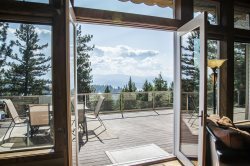 Bear Paw Mountain Lodge is an expansive lakefront home that offers as many incredible features outside as it does inside. Situated 20 minutes from downtown Coeur d’Alene, you’ll have easy access to shopping, dining, public beaches, and attractions—should you ever choose to leave. Wrapped in near floor to ceiling windows, the massive main floor offers breathtaking views of the river from almost anywhere. The large gourmet kitchen is stocked with high-end appliances and cookware, plenty of granite counter space, and a bar with seating for 4. An adjacent wooden table seats 6 and another wooden table for 6 is comfortably situated around the corner from the kitchen. When you’re ready for entertainment, head over to the wet bar, comfortable bar stools, and pool table—all located on this main floor. Those who want to relax and unwind have plenty of options, including chatting in cozy chairs situated around a small table, watching TV from the plush couch, or pulling up a chair by the stone fireplace. The main floor also opens right onto the huge patio and outdoor living area. The outdoors is as expansive and impressive as the indoors. Surrounded by gorgeous landscaping, multiple tables and chairs are spread across the huge stone patio—offering plenty of seating for large groups. Plus, its location right above the river allows everyone to enjoy the views without having to take the stairs to the water. If you would like to access the large dock and boat slip, you’ll only have to travel down 2 levels of stairs. In the evenings, your group will love taking a dip in the hot tub or sitting around the fire pit! Even more outdoor features await from the 4 expansive bedrooms and 4.5 luxurious bathrooms located on the upper level of the home. One of the bathrooms even has a cedar-lined sauna! The master bedroom has its own stone fireplace with seating and a private patio to enjoy your morning coffee. Another bedroom offers a unique treat. Out of this bedroom’s door is a small bridge that leads to a waterfall; cross the bridge, take a seat and you’ll be overlooking the river while the home’s waterfall runs past your feet! This home is pet friendly for well behaved dogs. Dogs cannot exceed 30 lbs and must be kenneled when left alone and preferred to occupy only the lower level of the home. Thank you for your understanding. This beautifully upgraded home is the perfect place to enjoy a weekend of entertainment, relaxation, and lake views. They were awesome! I had called to ask question about the house, so I would know what I need to bring and they always answered my question immediately. The well collapsed at the original house we rented and Vacation Rental Authority put us up in another house. We had rented a house on the water and they were able to put us in another house on the water. They were very accommodating. We would go through you again for renting a place to stay. Lindsey was great! She helped me find the Bear Paw Mountain Lodge after another company kicked me out of the previous home I thought I was renting. Lindsey suggested the Bear Paw Mountain Lodge for our stay and it was awesome. Thank you Lindsey! Our Family enjoyed this beautiful home while on our vacation in Coeur d'Alene. We had plenty of room for the 9 of us. The view from the many windows in the living room and kitchen were awesome! We enjoyed the hot tub and the private dock on the water. We would highly recommend this home to anyone that is staying in the area.